I thought I would take inspiration from the internet to see what other people have been doing for good deeds and I stumbled upon one where someone put a 5 dollar note in a plastic bag with a little message and stuck that on a public vending machine. This is something very easy to do, doesn't involve much money and is bound to put a smile on someone else's face - it was perfect for me to try at work. However the company I work for is rather small, around 30 employees, and we do not have a vending machine (yet). The closest thing we've got is a Tuck Shop which is run by Gary, one of the line managers. Basically, he goes out to buy crisps, chocolates, drinks and other little snacks and puts that on a desk at work and whoever wants to have something that's in stock, pays a flat fee of 50 pence for each item. It works off honesty as there's no one to monitor whether you're actually paying for an item you're taking. Of course if you were to buy the same thing from the supermarket, you'd pay cheaper but whatever profit is made from the Tuck Shop is donated to one of the charities our company works with. A good thing! 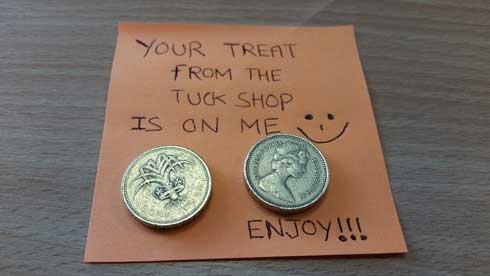 YOUR TREAT FROM THE TUCK SHOP IS ON ME :) ENJOY!!! It was enough money for 4 people to get a little treat. I left the note at around 2pm but it was bad timing because someone in the office distributed some doughnuts around half an hour earlier. So I didn't think anyone would be going to the Tuck Shop that day. However at around 15:30, I went to check and the money and note was gone. Honestly, I was really annoyed. I wanted to do something nice for the people I work with but I think someone thought it would be better to just put the money in the money-box as charity and discarded my note altogether. Sometimes we get too focused on the action itself rather than the reason why we're doing something. When I reflected back on what happened, I got frustrated because in a way I wanted people to realise that it was a nice gesture from someone (me) even though I left the message as anonymous. This is what ego is all about - thinking about you first. I'm happy I realised where I went wrong with this and although my good deed didn't turn out as I expected, it remains still a good gesture. When you set out to do a good deed, you shouldn't think what's in for you, no matter how small and petty the thing you want in return is. Even thinking a SMILE is the least you'd expect from the other person is the wrong way to go about it. Be selfless in what you do; you'll avoid frustration and change things around you. What is my purpose in life? Why do I exist?